Went to my local tire store on Monday 6/4. Inquired about the China bomb tires. Listed what tires I have on my camp trailer》 Rainier ST.
What should I run them at ? Asst.mgr. said 60 (sixty) PSI. My tires on my camp trailer are very good tires. They don't need to be replaced , per the tire store. The Chinese had flooded the market with cheap tires. And Naturally manufacturer's wanted to save a few bucks , so they bought crap rubber to put on these units. If the company management actually wants to make a good product, they hold their own feet to the fire and make a good product. Unfortunately, a lot of Chinese companies see quality control as a needless expense that also causes them to trash some inferior product that they could sell to unsuspecting customers. Things seem to be improving with Chinese manufacturing and possibly the tire problem is past but I would be very suspicious of any obscure Chinese tire brands. Once bitten, twice shy...and boy did I get bit! Also don't forget factory tires tend to be marginal for weight and speed ratings, which exacerbates the poor quality tire situation. Also how old are they before they are even installed and not balanced. My zinger has 32 lbs in all the tires when I bought it but tire says max 65. Every time I've bought tires the people mounting have always inflated to 32 psi, I guess unless otherwise told that's the standard pressure & the guy mounting doesn't know any difference & honestly most drivers don't either. The auto dealer told me once that they do that on new cars so that they ride good when test driving. All ST trailer tires are designed to run at max pressure indicated on the sidewall. Running trailer tires at anything less than max invites overheating and sure trouble while max gives you the best trailing (handling), coolest running and the best fuel economy. So, if I am understanding this thread correctly I should fill my tires up to 65psi when the are cold or sitting overnight. Is that correct? Yes 65. 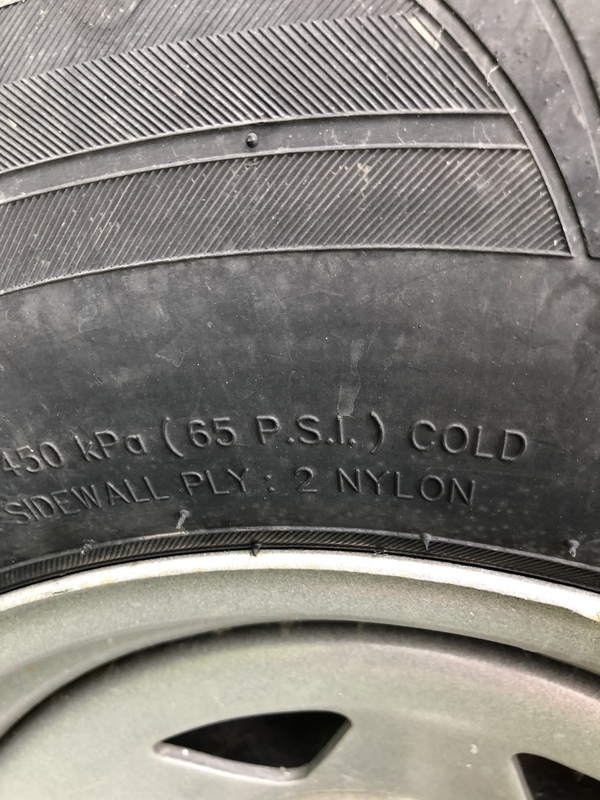 PSI cold means that it should be checked in the morning before you drive more than a few miles, or before rising outside temperatures affects the tire.